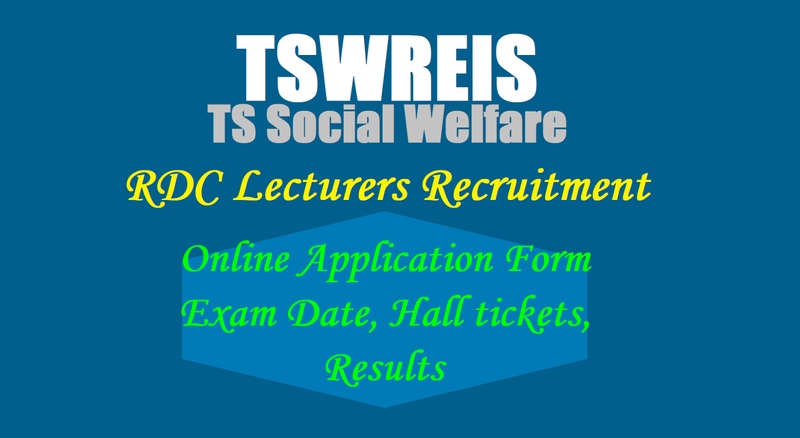 Tswreis Degree Colleges Lecturers recruitment 2017 final selection list, Exam date, Hall tickets/ Tswreis Degree Lecturers recruitment 2017 in TSWRDCs-application form: TSWRDC Degree Collges Lecturers recruitment, TSWRDC Teaching Staff Guest faculty, TSWREIS Teaching Posts recruitment,application form, last date for apply and eligibility criteria details given here: Telangana State Social welfare Educational Institutions Society has published TSWRDC Degree Lecturers Recruitment notification and applications are invited from the qualified and interested candidates to work on temporary basis as full time guest faculty in TS Social welfare Residential Women Degree Colleges in the newly sanctioned vacant posts for the Academic year 2017-18. 1) Download the application from the TSWREIS web site. 7) Submit The applications to The convener of TSW Residential School in district concerned On or before 31-05-2017. 13) The candidates belong to Telangana State Local Status only are eligible for all the posts. Others need not apply. 15) TSWR Degree College are fully Residential and the Candidates taken should work as per the residential nature of duties. Candidates may apply through online mode... The application forms and the information have to be downloaded from the website – http://tswreis.telangana.gov.in/ and the filled in applications have to be submitted on or before 05-06-2017., to District Convenor of TSW Residential Schools of the concerned district. 2. Hall tickets can be downloaded from 07-06-2017. 3. The written test will be conducted 12-06-2017 by 2 pm to 3 pm p.m. in the Telangana Social Welfare Residential institutions in Hyderabad. 1) To Report by 10:00 a.m for Counselling for allotment of places. 2) To Bring the following certificates in Original along with one set of Xerox copies. i) Memorandum of marks and Provisional Certificates of SSC and PG Course. ii) NET/SLET/SET/Ph.D Certificate if any. iii) Caste Certificate issued by Tashildar/MRO. iv) Study/ Bonafide Certificates from 1st Class to 10th Class. v) Experience Certificate if any. 3) Two recent Passport Colour photos.